For decades, the predatory for-profit college industry has exploited the promise of higher education, perpetrating a massive fraud on students who are trying to build a better life. The industry specifically targets low-income students, students of color, single parents, and veterans. Many are the first in their family to attend college. For-profit colleges recruit students with lies and false promises of well-paying jobs and meaningful careers. One school told prospective students that it placed 70 to 99% of students in jobs, when the reality was only 20 to 30% of students got jobs. Instead of providing the quality programs promised by recruiters, these companies invest almost no money into meaningful career training. Schools often lack the basic equipment necessary to teach a trade. In one study, less than 25% of for-profit colleges’ revenue went to expenses related to education. The majority of revenue goes to marketing and advertising, executive compensation, and shareholder profit. As a result, students are left with mountains of debt and without the employment to pay for it. 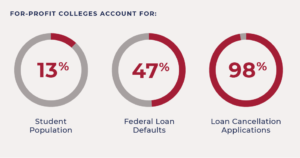 For-profit colleges account for 13% of the student population, but 47% of federal loan defaults. 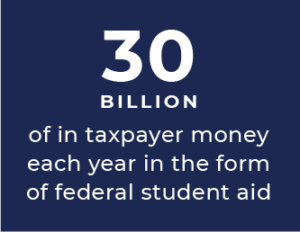 And 98% of all loan cancellation applications sent to the federal government in 2016 and 2017 were due to fraudulent for-profit colleges. Government funding and policies intended to help people improve their lives are instead enabling this industry to cheat students. The for-profit college industry is among the most heavily tax-subsidized of any private sector, taking more than $30 billion in taxpayer money each year in the form of federal student aid. Despite these predatory practices, the Department of Education has repeatedly sided with the industry, and against students and taxpayers. It continues to fund these companies and collect fraudulent student loans, while delaying and rewriting borrower defense rules that would protect students from forced arbitration. The Project on Predatory Student Lending represents students against the predatory for-profit college industry. The Project was formed in 2012 to combat the massive fraud that is being perpetrated against students and taxpayers by for-profit colleges, and government policies that enable the predatory industry to continue to cheat borrowers and taxpayers. The tax payer-funded for-profit college industry specifically targets students of color with aggressive and manipulative advertising tactics. Black and Latino students are disproportionately harmed. The debt associated with for-profit colleges is not only predatory, but racist. Click below to learn more about for-profit colleges and racial justice. 25% of money paid by students at for-profit colleges goes to their education. The rest is taken by the industry for marketing, executive compensation, and profits. More than $30 billion in federal tax funding goes to this predatory industry each year, making it one of the most tax subsidized of any private sector. Mary is a single mom who entered the Medical Assistant program at Everest Institute. The quality of the program was horrible. The students were forced to practice on themselves. One time, a student practiced drawing blood from Mary but due to a lack of training from the program, forgot to take the tourniquet out before the needle, and Mary’s blood spilled everywhere. Mary had to abandon the program. Shortly thereafter, she couldn’t find a job, lost her apartment, and lived in a shelter for two years. She never got a medical job, and is now a domestic violence case manager. She is in default on her $7000 in student loans from Everest Institute. Tina attended a Medical Assisting program at Sanford-Brown Institute (SBI), relying on SBI’s promises that its graduates had high rates of employment in their field of study; that SBI would provide meaningful job placement assistance; and that SBI’s credits were widely transferrable to legitimate higher education institutions. Only after incurring substantial student loan debt and graduating with a 4.0 grade point average, despite a period of homelessness, did Tina learn that all of these promises were false. After graduation, the only employment Tina could find was a part-time retail job paying little more than minimum wage, where she worked for almost four years to make ends meet. Tina is rightfully proud of her perseverance in obtaining her degree, but feels that in all practical senses, her degree is worthless.